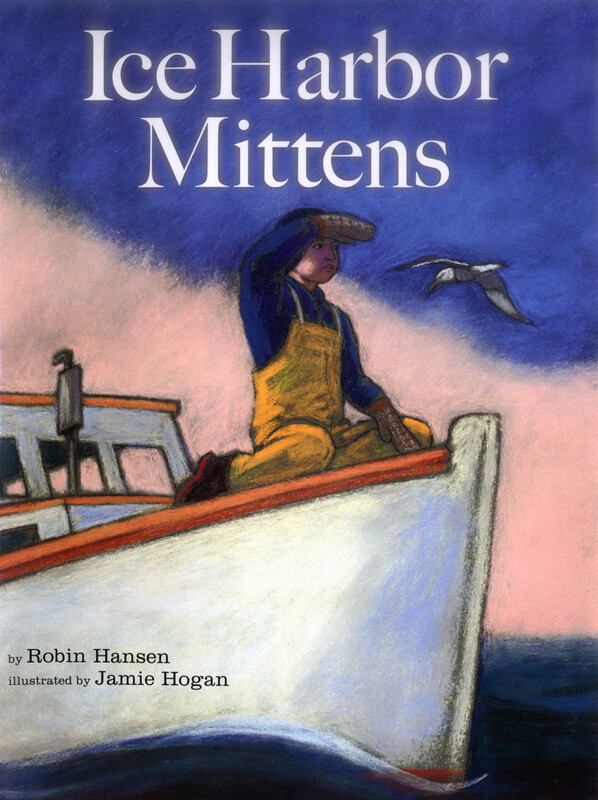 ICE HARBOR MITTENS by Robin Hansen, illustrated by Jamie Hogan, Down East Books, Camden, Maine, 2010, hardcover, 32 pages, $16.95. 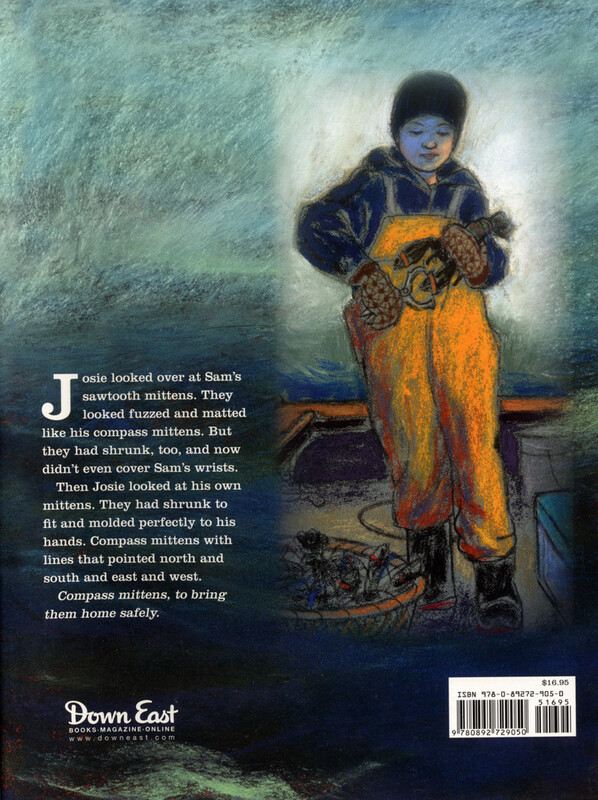 Atypical workday for Maine fishermen is transformed into a magical experience through Robin Hansen’s tale and Jamie Hogan’s colorful pastel illustrations in “Ice Harbor Mittens.” Fishing may seem like a summer endeavor, but in the fishing village of Ice Harbor, the fishermen pull traps year-round, and they need to stay warm. Lobster boat skippers and sternmen of Ice Harbor wear the same old-fashioned compass mittens made by Aunt Agnes. When 11-year-old Josie becomes sternman of his cousin’s boat, he’s proud to buy a pair for himself — until he sees other fishermen donning a new pattern. Though the compass mittens keep Josie’s hands warm at sea, he worries about wearing something old-fashioned. Hansen, a folklorist of West Bath, based the story on a tradition that is prevalent in Harpswell and in Nova Scotia, where village knitters create “compass mittens” for fishermen. The simple pattern ends up carrying a similar significance to Josie. When his cousin’s boat gets lost in a thick fog, they turn to the compass mittens to guide them home. 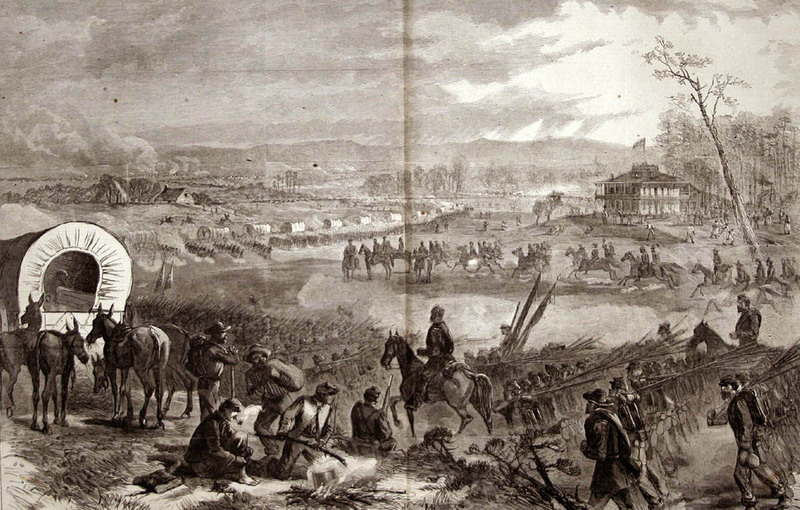 Hansen was thinking of Sebasco Village, West Point and the end of New Meadows River as settings for her story. But artist Hogan read “Ice Harbor Mittens” on Peaks Island and based her illustrations on communities there. Several lessons are woven into the mitten tale. For example, the boy learns that newer, popular items aren’t always better than what a person already possesses. He also learns to be thankful for gifts of generosity. Hansen is the author of “Favorite Mittens,” a collection of knitting patterns, and of the best-selling children’s how-to-knit book, “Sunny Mittens,” about a young girl who learns to knit traditional mittens. She’s willing to visit schools and libraries to read aloud and talk to children about mittens, knitting and the Ice Harbor story. Her contact information will be on her blog, which will be online soon. Hogan of Peaks Island teaches illustration at Maine College of Art, and her first book, “Rickshaw Girl” by Mitali Perkins, has won numerous awards including the Jane Addams Peace Association Honor in 2008. For information on Hogan, visit www.hoganbraun.com.